Make Plumbing a LS Engine Swap a Snap! This fuel line kit includes 25 feet of line and all the fittings that you need for your LS engine swap using our fuel pumps. This kit is designed for LS engines that have a single fuel inlet fitting. 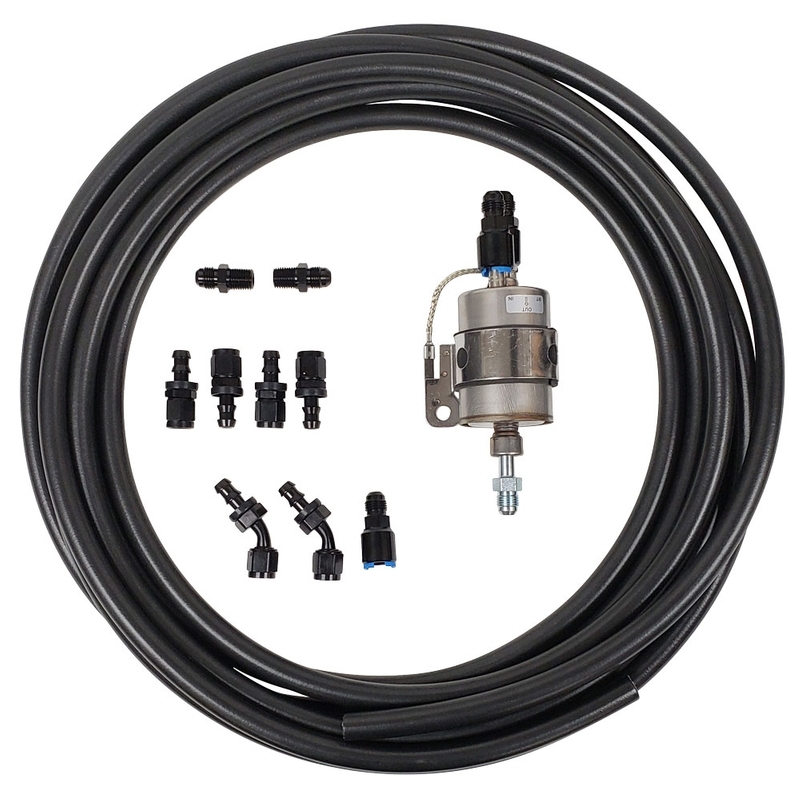 The regulator in this kit is not recommended with fuel pumps that flow over 255 lph. Click Here for a diagram on how to run fuel lines using this kit. The tanks listed above require the LS-LINE-KIT45. This kit has two 45 degree fittings instead of straight. These tanks have a recessed bowl where the fuel pump is mounted. The 45 degree fittings point up out of the bowl for easier accessibility. For the enthusiast looking for a quality performance hose while wanting to save assembly time and money, Russell Twist-Lok hose is the way to go. Flexible and lightweight, this hose is ideal for most automotive applications. Compatible with hydrocarbon and alcohol based fuel, lubricants and additives. Lightweight and flexible and works with all AN adapter fittings. Use with reusable twist-Lok hose ends with pressure rated up to 250 psi - suitable for most fuel and oil systems.